Located in East Asia, the People’s Republic of China is the most populous country in the world and the second/fourth largest in terms of land area. The country’s terrain is mostly mountainous with high plateaus and deserts in west; the east on the other hand comprises plains, deltas, and hills. 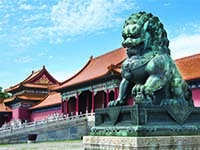 From the awe-inspiring complex of the Forbidden City in Beijing to the cosmopolitan streets of Shanghai, travellers from across the globe are heading to China to experience its remarkable sights and sounds. 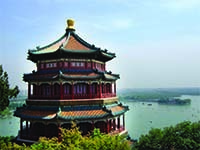 Travel to China for an unforgettable holiday! Shaanxi holds some of China’s most incredible ancient sites, including the Terracotta Warriors, the Tomb of Emperor Jingdi, as well as Xi’an’s historic Muslim Quarter and ancient city wall. Simultaneously, Shaanxi’s mountains and rural farm villages are untouched by modern development, and provide an incredible contrast to the province’s bustling cities. The nature reserves of Changqing and Foping are a wildlife paradise hosting China’s most incredible endangered animals like the golden snub-nosed monkey, undisturbed by crowds of visitors. Not to be outdone, Chengdu’s Wenshu Monastery, the holy mountain of Emei Shan, and world’s largest stone-carved Buddha are some of the most interesting travel destinations in the Sichuan province. And with verdant low-lying valleys, spectacular white-capped mountains, rustic towns and villages, and a lively mix of twenty-six ethnic minority communities, Yunnan has long inspired poets and travellers alike. 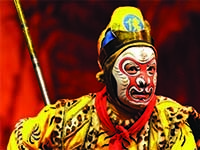 Spanning a vast range of cultures and landscapes, Chinese society is increasingly defined by its staggering contrasts. 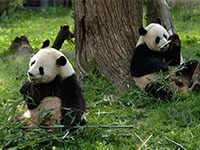 A world away from the metropolises of the east coast, guests can travel to ethnic minority villages among the jagged peaks of the Tibetan highlands, visit lush nature reserves or pandas in their breeding centre, or even stroll along the ancient Silk Road. Huanglong National Park featuring coloured limestone ponds of blue, yellow, white and green.